Over the years, many people have gotten lucky with Lotto Max, Canada's biggest lottery game, and taken home millions of dollars. 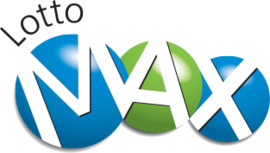 The largest prize given away was CA $60 million, which is the maximum jackpot that can be won through Lotto Max. The odds of matching all seven numbers in Lotto Max are 1 in 28,633,528, but a few lucky lottery players have managed to pick the winnings numbers and grab big prizes amounting to millions of dollars. Let's find out who were the biggest Lotto Max winners, what their winnings were, and what they did with their money. 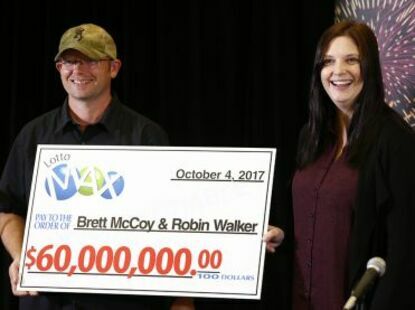 The September 22, 2017, Lotto Max draw changed the lives of Brett McCoy and Robin Walker forever. With a simple $11 Quick Pick, the couple won the $60 million jackpot, which was the largest in Alberta's lottery history and one of the largest in Canadian lottery history. McCoy and Walker lived in Peers within Yellowhead County. McCoy was a pipeliner while Walker was a stay-at-home mother of four. One day they went out to buy feed for their chickens at the McLeod Trading Post when Walker noticed that their ticket had won the Lotto Max jackpot. At first, she thought that the prize was only $60,000, but the clerk working at the post corrected her. The couple revealed in an interview shortly after they won that they didn’t want to make any rash decisions about how they will spend their money. However, they did buy a new truck before picking up their $60 million cheque, and McCoy was contemplating taking time off from his job. "I’ve been buying tickets off and on for years," McCoy said. "You can’t win if you don’t buy one, right?" he added. Truer words have never been spoken. On March 14, 2014, someone bagged the $50 million Lotto Max jackpot, but no one stepped in to get the prize until 21 months later. It was later found that Friedrich Mayrhofer, a 67-year-old man from Langley, British Columbia, was the winner. Accompanied by his wife and son, Mayrhofer went to the office of the B.C. Lottery Corp. (BCLC) to claim his prize on December 15, 2015. At the press conference, he described himself as a shy individual who wanted to keep his affairs within his family. Mayrhofer revealed that the reason why his family didn't claim the money right away was due to their concern that they might not be able to handle such huge winnings. As a precaution, his family hired a group of advisers and a lawyer. Initially, the trust lawyer of the Mayrhofers tried to retrieve the prize money, but the BCLC didn't allow the exchange to take place with a third party. Prior to that, the BCLC already received 739 inquiries about the prize, and some even tried claiming the jackpot money. According to Jim Lightbody, president of BCLC, they reviewed each claim but only Mayrhofer's ticket was valid for the $50 million jackpot. Mayrhofer said that he should have taken the money earlier because of its potential to earn $500,000 in interest if he had invested it. His priority lay in his family though, so he first made sure that their security was not compromised before receiving the prize. It remains a mystery how the Mayrhofers have spent their $50 million. But based on their cautious approach in handling money—as shown by their reluctance to get their winnings right away and hiring professionals to help them manage it—they likely used it wisely. In 2016, an email began circulating saying that the Mayrhofers were giving away $5 million to 5 lucky recipients. 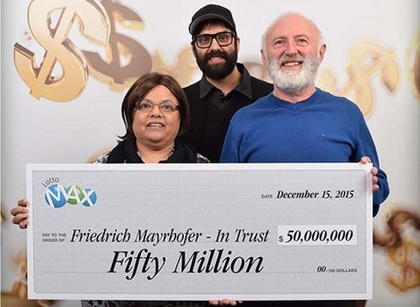 It claimed that Friedrich and Annand Mayrhofer were only keeping $1 million of their winnings because they already had enough money. In addition, it said that they have given most of their money to various charities. The Mayrhofers couldn't be reached to comment on the issue, but Angela Koulyras, a BCLC spokesperson, pointed out that she hadn’t heard of the letter. She stated that it was probably a phishing scam because the sender was asking recipients for personal and banking details. Deanna Bergeron of Cornwall, Ontario, just went out to buy ice cream one day, but a side trip to a Lotto Max outlet resulted in a $50 million win. 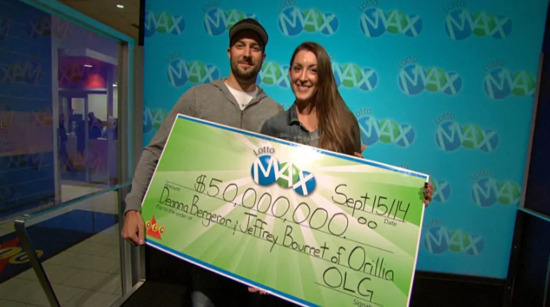 After the September 5, 2014, draw, Bergeron and her fiancé Jeff Bourret claimed the cheque from the Ontario Lottery and Gaming Corporation (OLG). The couple was overwhelmed with the huge amount they got, so when asked about what they will do with the money, they said they would use it for a trip to Hawaii and to buy a few new vehicles. If we had to guess, we’d wager they probably spend a good chunk of it on their wedding too! In February 2018, 30 men and 1 woman from Newfoundland and Labrador (NL) shared the $60 million jackpot in Lotto Max. Tracy Shute of the Atlantic Lottery Corporation said that it was the largest prize given in NL. Each winner took home $1.9 million. Some of the winners were wondering if their good fortune was some sort of payback for their generosity to others. One of the winners, Dustin Flight, had given $4,500 to a family member whose child was very ill before winning the big lottery prize. 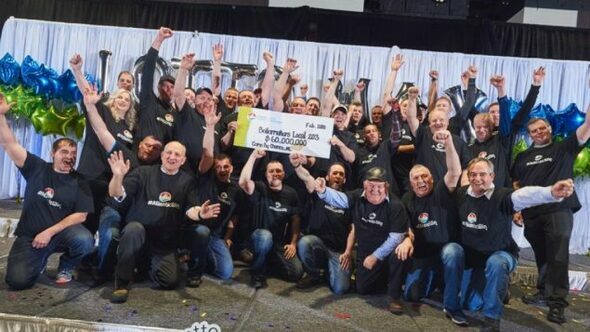 Twenty-six of the winners were workers of an oil refinery in Come By Chance, NL. Instead of retiring, the workers said they would actually stay in their jobs—sounds like they must have really loved their work. For as low as $5, you could be the next to join this list of big Lotto Max winners. Quoting McCoy, who won the $60 million jackpot, "You can’t win if you don’t buy [a ticket], right?" So, what are you waiting for—why not try your luck? If you’re in Canada, go to your nearest lottery ticket retailer or, if playing from abroad, play through an online lottery agent. Who knows, maybe you could be the next multimillion-dollar Lotto Max winner.